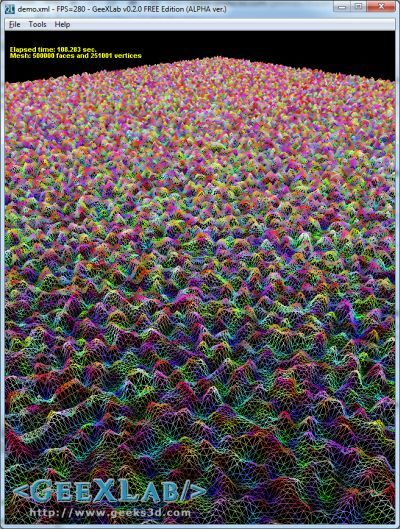 Here is an useful piece of GLSL code: a noise generator and its core function: a pseudo random number generator. I found this code in one of the Shader Toy demos (iq is really a GLSL wizzard!). 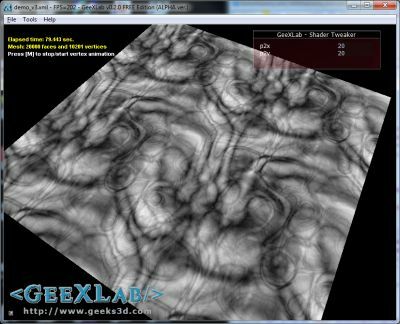 I quickly extracted the interesting functions and tested them with GeeXLab. The nice thing with this pseudo random generator is that it is only based on mathematic tricks. Actually the core of this random number generator relies on a LFSR (linear feedback shift register) generator. LFSR requires bits manipulation with operators like >>, <<>>, ^ or &. VirtualDub’s developer talks about LFSR in this post. In GLSL, bitwise operators are provided by the GL_EXT_gpu_shader4 extension. 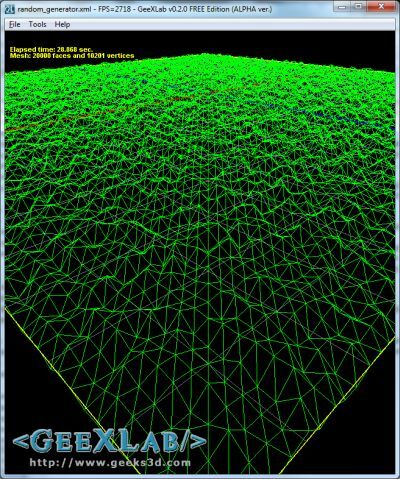 According to Geeks3D’s OpenGL extensions DB, GL_EXT_gpu_shader4 is supported from Catalyst 8.10 for Radeon cards and from ages on NVIDIA boards. – Integer bitwise operators are now enabled. 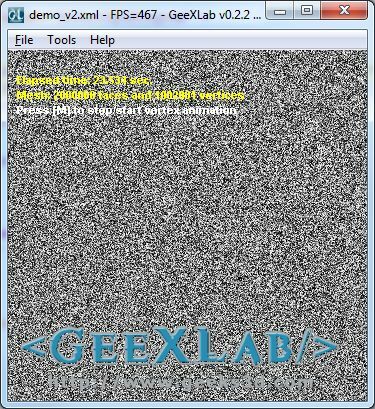 Just launch GeeXLab and drop demo source code in. The source code is localized in the demo_v1.xml or demo_v2.xml or demo_v3.xml files. The shortcut [Ctrl+R] in GeeXLab allows to reload the demo once you have modified the source code. You can stop/start the deformation animation by hitting the SPACE key. 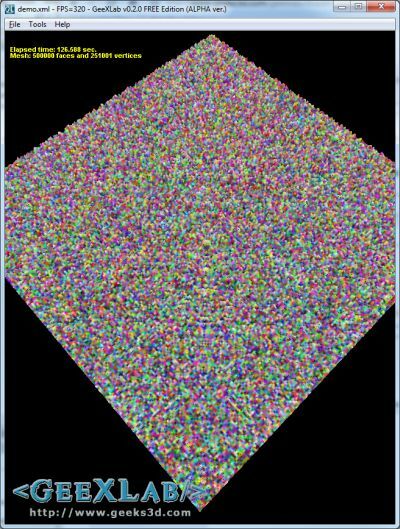 The second demo (demo_v2.xml) uses the random number generator in both vertex and pixel shaders with a plane made up of 1000×1000 segments: 2000000 faces and 1002001 vertices. // <<, ^ and & require GL_EXT_gpu_shader4. All demos have been successfully tested on a GeForce GTX 460 (R258.96) and on a Radeon HD 5770 (Catalyst 10.8). This cool noise3f() function is useful for many effects like this one: the generation of a Worm-Lava-Texture I discovered in the Making of Ergon 4k PC Intro. Here is the pixel shader. The complete source code is loalized in the demo_v3.xml. p2 is an unifom vec2 I used to scale the texture coordinates. It’s controled from the demo via a tweak bar. Are you sure that “n = (n << 13) ^ n; return (n * (n*n*15731+789221) + 1376312589) & 0x7fffffff;" is LFSR? Both the wikipedia article and virtualdub article you link to show implementations of LFSR that use a lot of bitshift, while your version is multiplying by large primes. Am I missing something? Are they really the same algorithm?